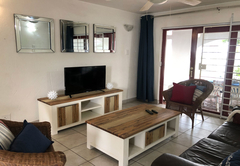 Pelican Pad @ Le Paradis is a property providing self catering in Ballito for up to 4 guests visiting the Dolphin Coast region. 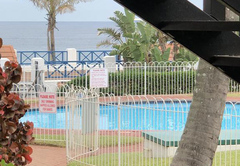 Pelican Pad @ Le Paradis in Ballito accommodates up to four guests in a secure complex that is situated on the beach. 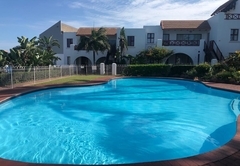 The apartment is 2.8 km from Ballito Shopping Mall and is close to restaurants and a number of activities. 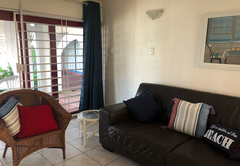 Pelican Pad @ Le Paradis is a ground floor self catering apartment with two bedrooms and two bathrooms with a bath or shower. 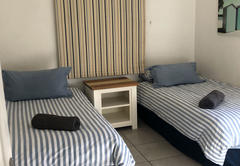 The main bedroom has a double bed and the second bedroom has two single beds. 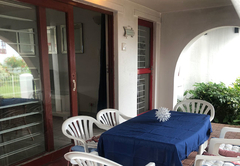 The living area is open plan and has a fully equipped kitchen, lounge and dining area. 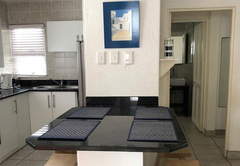 The kitchen has a dishwasher, washing machine, fridge, microwave, tea/coffee making facilities, oven and stove top. 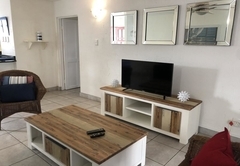 The lounge has a flat screen TV with DStv and opens to a small patio with outdoor furniture and braai which overlooks the complex swimming pool and garden. Access to the beach. 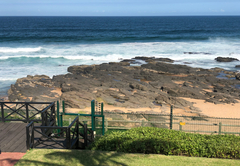 In the heart of the Dolphin Coast, Ballito lies between the fields of KwaZulu Natals famous Green Gold and is flanked to the east by golden beaches and the warm waters of the Indian Ocean. 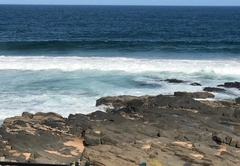 The waters off Ballito's Beach are the playground of the bottlenose dolphins, which frolic in the waters close to shore and are visible all year round. The dolphins favour this stretch of coastline because of it's relatively clear and shallow waters, allowing dolphins to swim close to shore in order to feed. Whales can also be spotted on their annual migration to Mozambique for the summer. 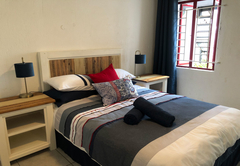 Pelican Pad @ Le Paradis is a ground floor self catering apartment with two bedrooms and two bathrooms with a bath or shower. 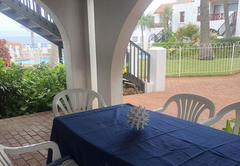 The living area is open plan and has a fully equipped kitchen, lounge and dining area. Response timePelican Pad @ Le Paradis typically responds to requests in 5-10 minutes.